My husband and I have officially sold our current home and are set to take possession of our new home (our forever home quite possibly) by the end of week. To say that we are excited is an understatement. We are a little stressed by all that moving entails. I am currently in the middle of packing up the kitchen (we have amassed a large assortment of kitchen and baking equipment and gadgets over the last 8 years… and that’s after I Marie Kondo’d our stuff). Nonetheless, the blog needs content (I skipped last week so I feel guilty). Today’s post is a chicken recipe for garlic lovers! In particular, tasty (and inexpensive) chicken thighs combined with wonderful fresh garlic along with fragrant rosemary and the bright zing of lemon. It’s a no-fuss recipe that uses few ingredients, but creates rich, scrumptious flavours. It’s lovely paired with a side of rice (I used a wild rice blend if you’re wondering from the pictures) and a quick roasted asparagus for a complete, healthy meal. 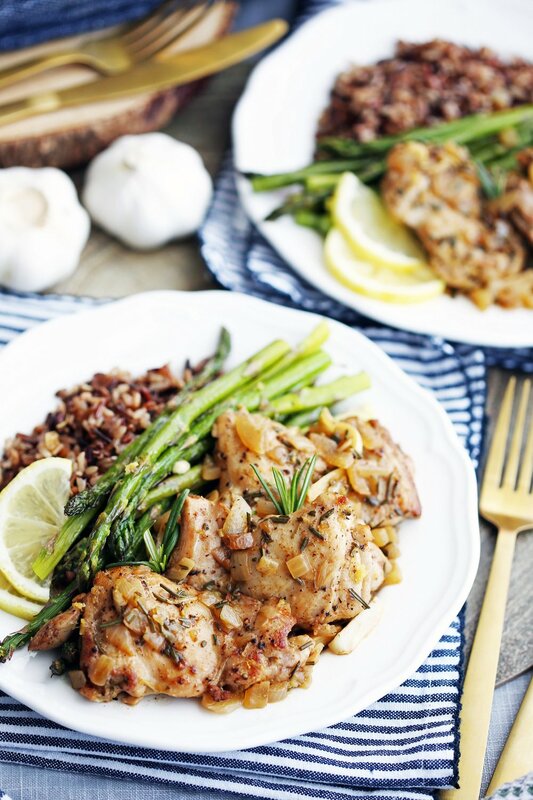 I hope you enjoy this recipe for One-Pan Rosemary Garlic Chicken! Make sure you use a large skillet/pan with a lid. You’ll need a fitted lid to finish cooking the chicken. Prepare all the ingredients before you start cooking. Take out all the ingredients and measure, chop, juice, etc. before you start cooking. You’ll know that you actually have all the ingredients you need for this recipe if you do this. Also, this helps prevent the potential for overcooking or burning ingredients (you’re not running around trying to find ingredients or prep them). How do you make this chicken recipe? 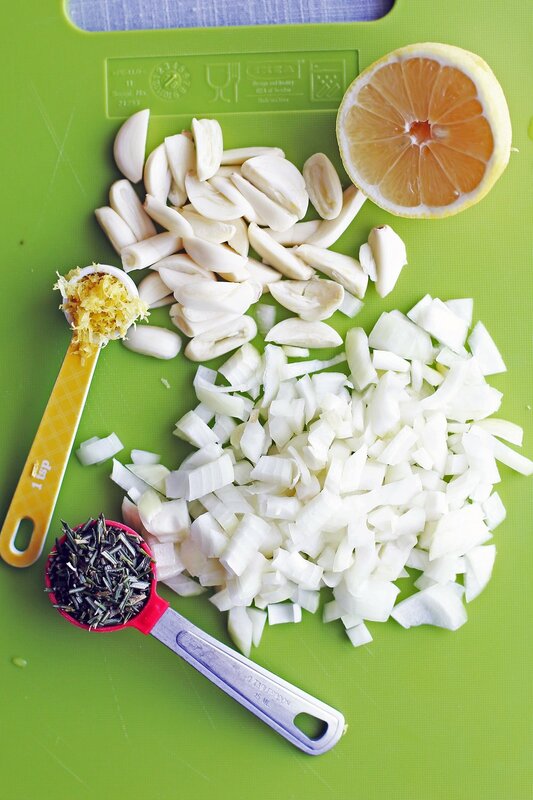 Prepare your ingredients such as quartering your garlic cloves, dicing the onions, mincing the rosemary, and zesting (and juicing) the lemon. Full ingredients amounts and complete instructions in the recipe card down below. Pat the chicken thighs dry with paper towels and salt and pepper each side of the chicken. 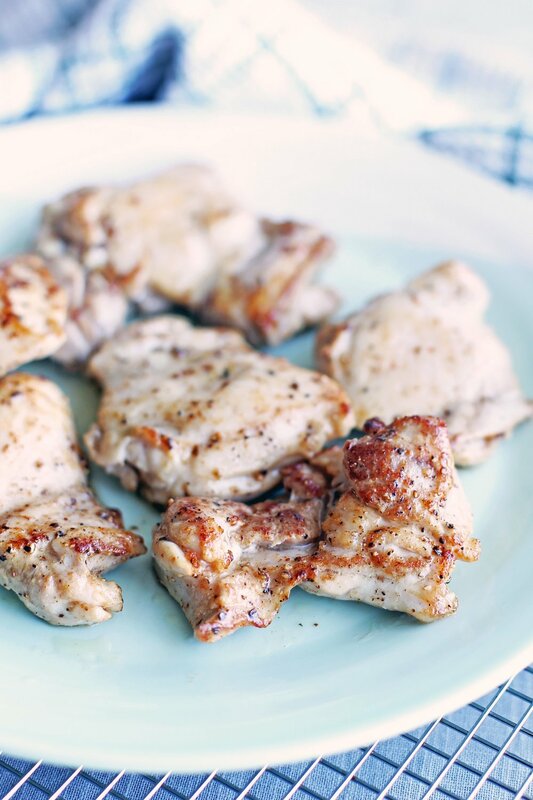 Melt butter in a pan and brown both sides of the chicken thighs. Remove onto a plate. 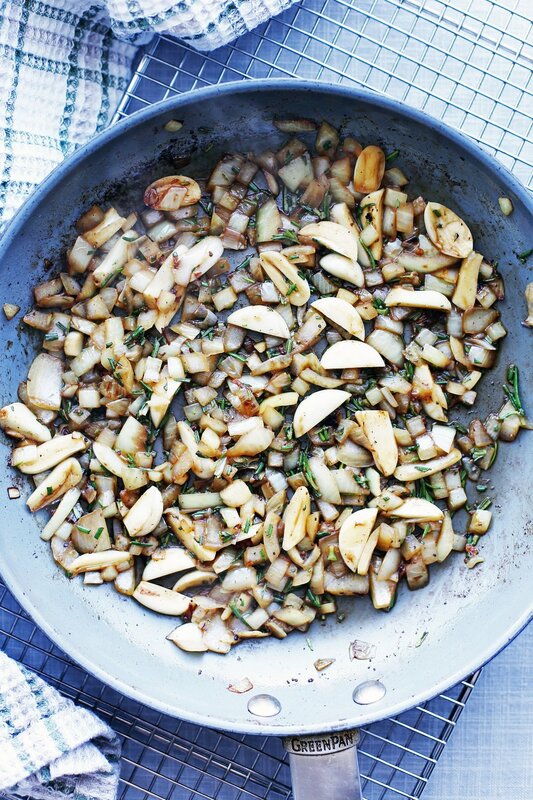 Sautéed garlic and onions in the pan until light golden-brown in colour. Add rosemary. Deglaze the pan with chicken broth. Return the chicken back to the pan along with the more chicken broth, lemon juice, and zest. Bring to a boil, then reduce to a simmer, cover and cook for an additional 10-12 minutes until the chicken is fully cooked through. Plate the chicken thighs and spoon over with the garlic sauce. Serve with the sides of your choice (like rice and roasted asparagus). Best served immediately. Looking for more delicious chicken dishes? Take a look at these four! Creamy Chicken Fettuccine (made in the Instant Pot). 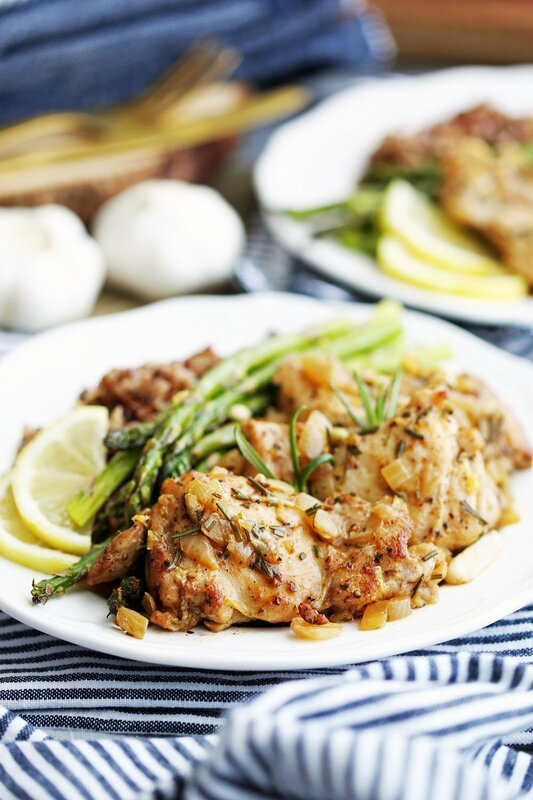 Is delicious and savoury: Tender, juicy garlic rosemary chicken is just so tasty! Is quick and easy to make: It’s all made in one-pan and in only 30 minutes. Uses simple ingredients: The ingredients are (probably) easy to find at the grocery store or perhaps in your kitchen pantry and refrigerator already. Is great to make for a quick weeknight dinner or on a lazy day. I hope you try this garlic chicken! If you do, please leave me a rating and comment down below or tag me on any of my social media. I’m @yay_for_food on Instagram. Please share your recipe pictures! Using a paper towel, dry chicken thighs. Generously salt and pepper both sides of the chicken. In a large skillet at medium-high heat, add butter and swirl the pan to allow the butter melt. Place the chicken thighs in a single layer in the pan and brown the chicken on both sides, about 2-3 minutes on each side. Move them onto a plate and set aside. Add the garlic and onion to the pan and sauté (using a wooden spoon) at medium-high heat until light golden-brown, about 3-4 minutes. Pour in ¼ cup of chicken broth and add the rosemary, stirring and scraping the bottom of the pan to remove/dissolve any brown bits. Return the chicken to the pan along with the remaining ¼ cup of chicken broth, lemon juice, and lemon zest. Bring the broth to a boil before reducing to a simmer. Cover with a lid and cook for an additional 10-12 minutes until the chicken is cooked through (internal temperature is 165 degrees F). Plate the chicken thighs along with lemon wedges and spoon over the garlic sauce. Serve with sides of your choice (such as rice and roasted asparagus). Nutritional information represents one serving (two rosemary garlic chicken thighs) for a total of three servings.